Achieving your goals requires both passion and action. Knowing when to emphasize passion and when to emphasize action are the keys to managing yourself, or others, toward achievement. 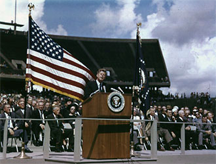 On September 12, 1962, US President John Kennedy, in a speech at Rice University, in Texas, sets a goal of reaching the moon "before this decade is out." At the time, only four Soviet Cosmonauts and two US Astronauts had orbited the Earth. The longest mission to that date was 94 hours. On the immediacy spectrum, the goal of reaching the moon was at the less-immediate end. Photo courtesy U.S. National Aeronautics and Space Administration. Goals have a property we can call immediacy. An immediate goal is directly connected to whatever you're doing right now. For instance, right now I'm typing this with the goal of finishing the article you're reading. By contrast, less immediate goals are less directly connected to what you're doing right now. For me, right now, a less immediate goal is to help project teams work more effectively. I'm typing this, in part, because I hope that people reading it might gain some insights that they can apply. Imagining success is far less effective for immediate goals. If I want an ice cream cone from the store across the street, imagining it probably won't make it happen. To achieve immediate goals, focus on what you have to do, and then you'll take action. For a less immediate goal, focus on the goal, and the doing will take care of itself. For a more immediate goal, focus on the doing, and the goal will take care of itself. It's when we get the two confused that we get into trouble. To help people and organizations achieve goals, use these same principles. As a manager or leader, you're responsible for your own personal goals, but you also take some responsibility for organizational goals and for goals of subordinates. When the goal is immediate, do what you can to help people focus on what they need to do to achieve the goal. When the goal is less immediate, do what you can to help them visualize achieving it. into troubleFor instance, a near-term project milestone is an immediate goal. Although focusing the attention of the team on the milestone might be helpful, still more helpful would be a focus on this week's work, because that's what people must do to achieve the goal. On the other hand, since goals related to, say, business development tend to be less immediate, a more vision-oriented approach is likely to be more effective for them. Focusing a team's energies on what life will be like when we complete this set of projects could provide people with the guidance they need to set their own priorities consistent with that less immediate goal. For more on achieving and inspiring goals, see "Corrales Mentales," Point Lookout for July 4, 2001; "Commitment Makes It Easier," Point Lookout for October 16, 2002; "Beyond WIIFM," Point Lookout for August 13, 2003; "Your Wishing Wand," Point Lookout for October 8, 2003; "Give It Your All," Point Lookout for May 19, 2004; "Knowing Where You're Going," Point Lookout for April 20, 2005; "Workplace Myths: Motivating People," Point Lookout for July 19, 2006; and "Astonishing Successes," Point Lookout for January 31, 2007. Would you like to see your comments posted here? rbrenJQOXApFiPWMuJbqhner@ChacxQukyFJooZeYgIGWoCanyon.comSend me your comments by email, or by Web form. Facilitators of synchronous distributed meetings (meetings that occur in real time, via telephone or video) can make life much easier for everyone by taking steps before the meeting starts. Here's Part III of a little catalog of suggestions for remote facilitators. Outsourcing internal processes exposes the organization to a special class of risks that are peculiar to the outsourcing relationship. Here is Part II of a discussion of what some of those risks are and what can we do about them. When a team is divided, and agreement seems out of reach, attempts to resolve the conflict usually focus on the differences between the contrasting positions. Focusing instead on their similarities can be a productive technique for reaching agreement. I offer email and telephone coaching at both corporate and individual rates. Contact Rick for details at rbrennPytpHbnDLnpVixcner@ChacZmbNDvAUfLxSVOvXoCanyon.com or (650) 787-6475, or toll-free in the continental US at (866) 378-5470.